Edited by Brian Ceresa . For decades, endocytosis has been recognized as a fundamental cellular process that regulates the uptake of small molecules (cell surface proteins, bacteria, toxins, etc.) into the cell. So why, after years of study, does this simple process warrant more discussion? Anyone who has examined the endocytic pathway will appreciate that this conceptually simple mechanism is highly complex and sophisticated. Like ballet dancers who make their synchronous performance seem effortless, the cell brings in molecules via a carefully choreographed mechanism. However, closer inspection reveals very specific roles that are dependent on the cargo being internalized. There are differences in the routes of entry into the cell (calthrin-mediated versus nonclathrin dependent), pathways within the cell (recycling versus degradation), and consequences associated with each branch point (i.e. viral replication versus viral senescence). With each branch point there are differences in the resulting cell biology. There were several goals in writing this book. First, by bringing together researchers that study diverse biological processes, there is a side-by-side comparison of the commonalities and differences of these processes. Second, tools that are standard in one field can often be novel to another. With a common mechanistic link, each story reveals new experimental approaches. Next, the examples in this book help one look beyond the mechanism of endocytosis and onto the functional relevance. 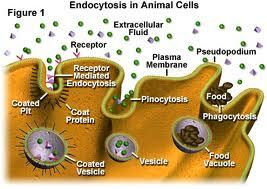 How does endocytosis support the life cycle of a virus? Does endocytic trafficking help or hinder the signaling by a receptor? Does the route of entry effect the toxicity of foreign substances? Finally, the later chapters in this book demonstrate ways in which the endocytic process can be harnessed for therapeutic applications. While endocytosis has been well studied, the work is far from done. This book will be part of the continuum in understanding endocytic trafficking. It is the hope that this book will be useful to scientists who have had a longstanding interest in membrane trafficking, those who have just begun their exploration, and those who need their curiosity satisfied.